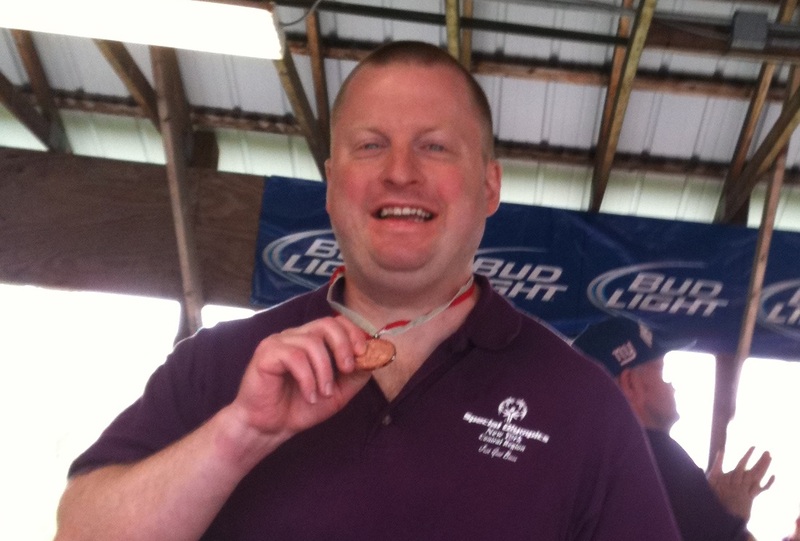 Joshua Nowlin, a Food Services staff member, recently won his 51st medal at the Special Olympics. Joshua Nowlin won his first medal at the Special Olympics when he was 8 years old. Since then he’s been hooked on the thrill of the games and the medals that come from the hard work. 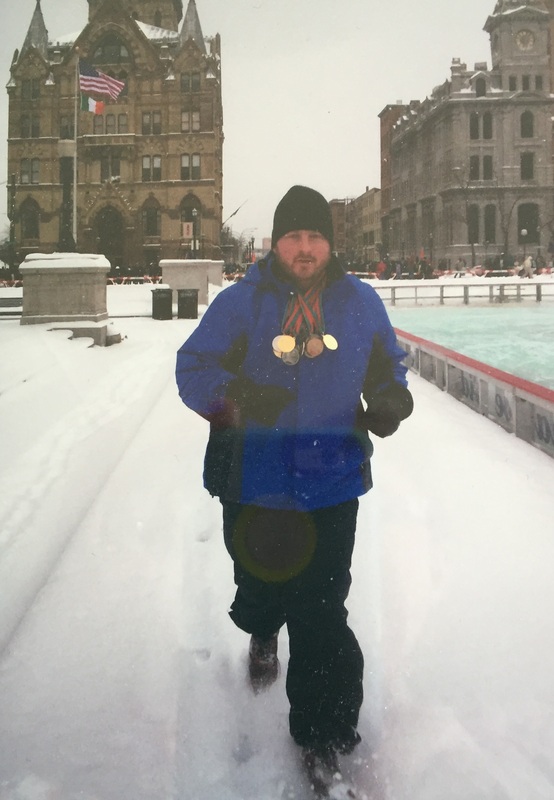 His dedication shows with his most recent win that marked his 51st Special Olympics medal, which was in bocce. His 50th medal was in basketball. Nowlin, a staff member with Food Services, has been participating in Special Olympics for more than 30 years and has played in various sports, including bocce, bowling, floor hockey, basketball, volleyball, track and field, and equestrian. “They are all my favorites,” Nowlin says. Joshua Nowlin, who has won 51 medals in Special Olympics, takes a run downtown. His first foray into competition was in track and field when he was 8 and he’s been competing every year since. 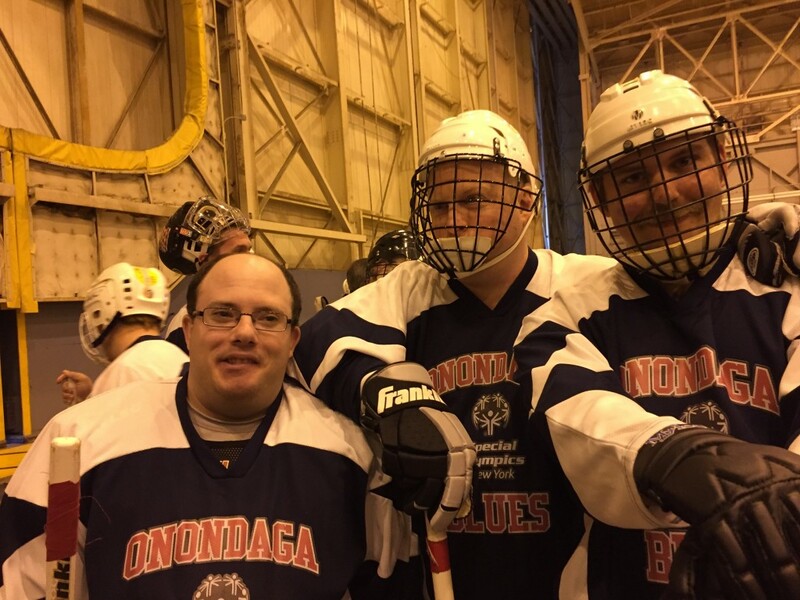 Originally from Chicago, where he first started in Special Olympics, Nowlin has also competed in the games in Idaho and Georgia, before moving to the Syracuse area when he was 28 and began playing indoor hockey. He also continues to play basketball and participates in the summer, winter and fall games. Part of the commitment is practice, and it’s all year round. “We practice during the week and weekends, and competitions are on weekends. Then we train for the state games,” Nowlin says. His coaches, who he thanks for their support, encourage Nowlin and his teammates as they practice and play in scrimmage games to prepare for competitions. Once the competition begins in any of the sports he plays, Nowlin says he’s always thrilled to just compete. “It’s like excitement and a challenge,” he says. 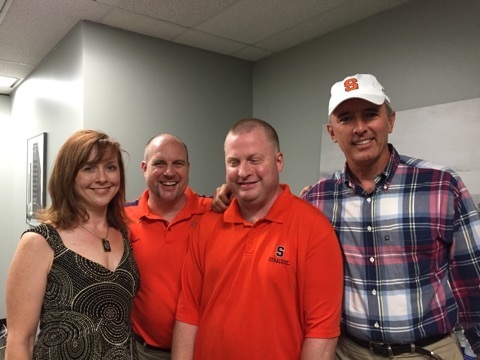 In August, Nowlin was invited to celebrate his birthday at the office of U.S. Rep. John Katko G’88, who also recognized Nowlin for his 50th medal win. Family members joined in the fun at the congressman’s office. 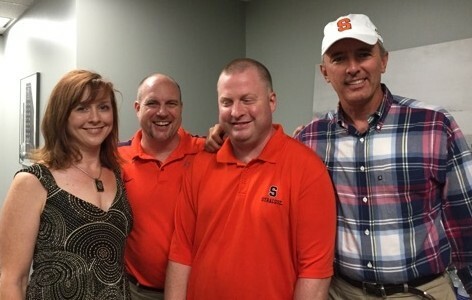 U.S. Rep. John Katko G’88 (far right) recognizes Food Services staffer Joshua Nowlin (second from right) for recently earning his 50th Special Olympics medal in August. They are joined by Nowlin’s sister, Laura Enslin, a musical theater instructor in the College of Visual and Performing Arts, and his brother-in-law, Rob Enslin, a communications manager in the College of Arts and Sciences. Nowlin’s biggest fans are his family members, including his mom, Kay Paulsen; his sister, Laura Enslin, a musical theater instructor in the College of Visual and Performing Arts; his brother-in-law, Rob Enslin, a communications manager in the College of Arts and Sciences; and Nowlin’s girlfriend, Liz Angiolillo. “They want me to compete and stay active and just do my best,” Nowlin says. Next up for Nowlin, who plays forward in basketball and defense on floor hockey, will be the state winter games in Poughkeepsie, New York. What does he most enjoy about the competition? He will continue to play as long as he can; it’s just part of his life now. Joshua Nowlin (center), who has won 51 medals in Special Olympics, takes a break from floor hockey with his teammates.